With inscriptions in Sassanian-Pahlavi (Middle Persian). Circa 7th century AD. St. Thomas Mount (Periyamalai), Mylapore, Chennai, India. This granite cross is one of the two earliest available material witnesses to the presence of a flourishing faith in the southern part of India in the early Christian era. The cross dates back to the middle of the 7th century AD, by which time the Indian Christians had established close ecclesial relationship with the Persian Church. It was found at St. Thomas Mount, near Mylapore, in Chennai where St. Thomas the Apostle is believed to have attained martyrdom. The cross is both an artwork and an object of veneration. It is mounted on a pedestal with three steps. Floral decorations adorn the base, and the Holy Spirit is seen as descending on the top in the form of a dove. All the four arms are ornamented. The two lions sitting comfortably on the pillars hold a three-layered canopy above. The inscriptions are in Sassanian-Pahlavi or Middle Persian, the court language of the Persian Empire. The reading of the inscription as well as its meaning remains inconclusive. 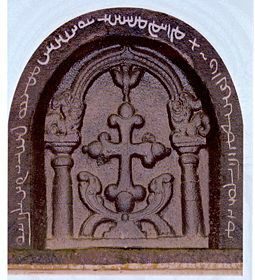 Similar crosses in bas-relief with the same inscription can be found in some of the ancient churches in Kerala. In view of its antiquity and symbolic value, the Government of India used the image of this cross on the postal stamp issued in 1972 to commemorate the nineteenth centenary of the martyrdom of the Apostle. To purchase copies, please click here.